P.O.Care Aloe Moisturizing Sun Lotion SPF 50 PA+++ is a lightweight, water-resistant, non-sticky and alcohol-free formula that ensures protection without irritating, both face and body skin. It is composed of natural extracts that are absorbed deep into the skin. Ogon Extract in it is an imported Japanese flower, which effectively works as an antioxidant, protects from the UV rays and acts as a whitening agent which helps nourish and revitalize cells for healthier skin. Aloe Vera Extract is rich in vitamins and minerals that helps moisturize skin and boosts collagen. 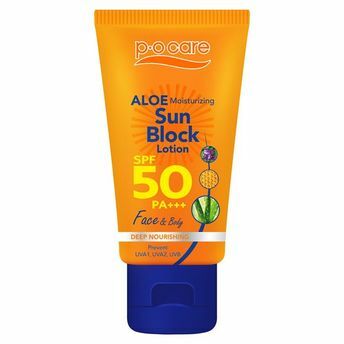 Alternatively, you can also find many more products from the P.O Care Aloe Moisturizing Sun Lotion SPF 50 PA+++ range.